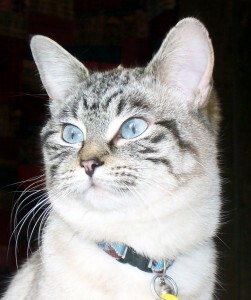 When I first met Aphrodite she was up for grabs; a ‘Nine Lives Rescue’ service feline. She was scrawny and lanky; where did she get such a big name, as clearly she was not the pick of the litter. She was maybe a year or so old. As I had no specific breed of cat in mind; just that it had to be a female and have short hair. Not yet aware of her extraordinary nature, I took her home without having the appropriate appreciation. My veterinarian discovered a fairly large hole in Aphrodite’s heart and proclaimed she may not live long. I accepted this news with mixed emotions and understood I would place no demands on her and take on the daunting responsibility of a life. Given her heart diagnosis, Aphrodite’s tenacity came as a surprise: she made it immediately clear that she was queen! Who could argue! So I waited on her hand and foot; cleaned her toilet as if it were my own. Her independent nature was also a miraculous marvel; aloft on her throne (cat tree) she would observe her queendom. All but me and a few close human friends were kept at bay. Those who challenged her rule were met with swift and sometimes sharp reprimand. During her seven years, the first six, she was the only feline in the house. Recently, sincing her time was near, I attempted to introduce two other cats; one at a time into our household. Of this, she was none too happy. My timing sucked in this regard. Aphrodite needed more, not less of my attention. I needed to be more attentive and affectionate; not less. I keep thinking Pieper needs more than my company…someone to play with…as I said, my timing was all wrong. Enter Tommy (I named him after my older brother, may he rest in peace) who was given to me by good friends on New Years day 2007. He was about 4 months old. Playful and beautiful. He and Pieper did play together, romping and chasing through the house on occasion. However, he disappeared after six months, on June 3rd. There are lots of wildlife; fox, coyote, sunks, racoons and hawks where I live. Wildlife could have eaten him or a neighbor scooped him up. I posted posters and looked in the area for months. 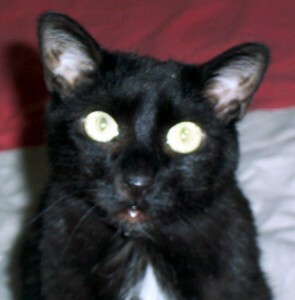 Then, in November 2007, I saw him on our street; absent his tail. He was walking in the direction of our home. I made the mistake of stopping my car and getting out, I scared him. He ran and entered the fenced yard of a nearby house. My theory is he barely escaped a fox, lost his tail and a neighbor rescued him; keeping him in the house all these six months. In March of 2008 I adopted Ami. I found her on the Pikes Peak Humane Society’s web site and picked her up the next day. She looks a lot like Tommy and about the same age, 1-2. She is very mellow, sweet and calm. She was not too interested in playing with Pieper, but would rub up against her and sleep nearby. Ami disappeared on a Friday, five days before Aphrodite went to kitty heaven. If she is alive and a vet ever scans her, she has a micro chip. These last few weeks I had grown increasingly impatient with Aphrodite; she had begun pooping on the floor instead of the litter box. Today, when I found she had peed on the floor in the laundry room, I said, “Aphrodite, what’s up with this?” All the time knowing she had not been getting the affection she wanted. I was distracted. Dog sitting for two dogs…and of course Pieper makes three and I was concerned and upset that Amy had been missing for five day. My hands and heart were full. I told her that she and Pieper would have me to themselves that very day; be patient. I hope I gave her a quick rub on my way out for a hike with the dogs. We were gone about an hour and on return I found Aphrodite laying on a purple sheet in the laundry room, at first I thought, why is she sleeping in the laundry room on Amy’s bedding. Then, I realized she was too still and knew she was not taking a nap. Have you ever witnessed a death? Ever been close to a person or animal who no longer takes a breath? The life force, energy or spirit has taken a jump; but her body still resonates a twinkle of life. I stroke her body, still warm and close her eyes: the finality not fully accepted; as I wait for the purring to begin. Where is her heart? So tiny, can I feel a beat? My hand holding over her heart. How peaceful. I honor a little life; and am again reminded how very precious; one so small leaving such heavy tracks on my heart. I placed her little body on a clean floral pillow case in her favorite bed and placed her on her cat tree where she loved to curl up and look out over her domain. She is directly behind me as I write…as she had been for so much of her life. Then ever so often she would trek in front of the monotor, as if to say, ‘it’s my turn’! Tears fill my eyes and I’ve a huge lump in my throat and my heart aches. Aphrodite you are missed. This entry was posted in Animals and tagged Aphrodite, extraordinary, feline, nine lives by Gailstrail. Bookmark the permalink. Oh, Gail, I sit here with tears in my eyes. Over the years I have known the grief with losing pets. It takes you to your deepest part. Yet, you have written a beautiful love story. I share your love of pets. Gale, thanks so much for taking time to stop by and read my ‘Aphrodite’ story. Reading your comment made me go back and re-read the story…and again my eyes too fill with tears as the renewed loss is experienced. I loved that little kitty!